Saif Ali Khan wears a Jaeger-LeCoultre Master Compressor Extreme W-Alarm in Happy Ending. This is quite a rare and special watch. 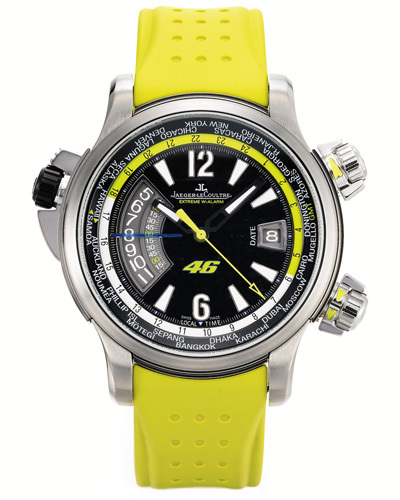 The exact model is the Jaeger-LeCoultre Master Compressor Extreme W-Alarm 177T47V 46 Valentino Rossi. This watch has yellow details on the dial, nr. 46 on the dial (nr 46 is the race number for motorcycle racer Valentino Rossi), and a yellow strap. Valentino Rossi, also known as 'The Doctor,' is an Italian professional motorcycle racer and 6 time MotoGP World Champion. In memory of his father he has always ridden with bike number 46. This extreme looking, limited edition (946 pieces), titanium sportswatch from Jaeger-LeCoultre features date, alarm with gong sound and worldtime. Saif Ali Khan wears the watch throughout the whole movie. The same model watch is also available in red or black or blue. Find this watch on eBay for around $11,000 - 14,000.